Dance and Art Forum: Why Dance in Museums? Dance and Art Forum: Why Dance in Museums? hosted by Siobhan Davies Dance in London took place on November 9th from 1.30-6.30pm. The afternoon consisted of presentations and discussions looking critically at the recent profusion of dance in museums, galleries and international art events. Siobhan Davies highlighted specific work they have done with collaborators in this area – including their touring work material / rearranged / to / be, the three-year Dance Artist / Curator Mentorship Scheme, the Creative Europe project Dancing Museums, and the publication WHO CARES? Dance in the Gallery and Museum (2015) for which I initiated and co-edited. All of these projects raised questions about the value of these appearances and encounters and about the opportunities and challenges visual arts contexts present for dance and choreography. The questions for the two panels were: What does the dancing body do for the museum? And, what does the museum do for the dancing body? The day aimed to articulate key concerns for further investigation in relation to this rich area of practice. I was part of the first panel, along with Catherine Wood, Senior Curator, International Art (Performance), Tate; Marie-Anne McQuay, Head of Programme, Bluecoat; and Lucy Suggate, dance artist. The panel was chaired by Lauren Wright, Programme Director, Siobhan Davies Dance. Some of the most striking things about the panel discussion, for me, were the different ways dance artists (in particular, Lucy Suggate and I) frame the work we do (as either artworks, dances, choreographies, interventions, practices and/or actions) in museums and, at the same time, have deeply embedded cross-over interests in relational space, sociality, alternative forms of engagement and modes of access and awareness. I appreciated Lucy’s references to “museum fatigue” and offering moments of respite as well as staying close, in her use of words, to the language of the practice as in “deep dancing”. It was a reminder of the ways in which we, as dance artists, lean on a certain use of language that may be new for museum spaces and, yet, we are also finding the space of the museum an experiential space to work out our interests in liveness and, as I pointed out, “beingness”. My reason for collaborating with the museum, I explained as part of the panel, was because it is a space for reflective, critical discourse. As my practice is bodily and conceptual that seek out discourse on the meaning and production, I find these spaces an engaging place to practice. I also shared my continued interest in and support for the theater and my concern for the mediated space of the gallery as having different temporal and spatial agendas. Both Lucy and I pointed to the economic realities of continuing to practice and that having space to present work in is vital to the sustainability of what we do. Catherine Wood pointed out that our discussion of dance practice in the museum leaned towards being about space. While I can agree with that, I am curious to unpack what that might mean in terms of practice. How does the space of the museum affect our practices? How much do we adapt and or make a case for our practice in the space of the museum? Space, time and weight are the cornerstones to choreographic practice. It then also becomes important to address, not only spatial concerns, but temporal ones and the labour of the body in that time and space. I focused my sharing on my work Punt.Point that has just finished a 3-year run at the Van Abbemuseum (2014-2017) and how, on reflection what initially seemed to be a work that playfully engages the space of the museum, now (three years later and after major socio-political shifts in the US and UK) reads as a potential resistance to invisible codes of behavior in public spaces. I explained that I take the museum as a site with its own spatial, temporal and social structure and my work responds to and makes those visible by proposing both a set of allowances or what I call “passports” to re-position the body (and potential agency of the body) in the museum. These poetic moments of resistance seem to resonate with the civic and with civic engagement at this particular time in society. I suppose I made a call to look beyond aesthetics of dance inside of the museum and what it means to be engaging such bodily acts and social cohesion in relation to the goings-on of our world outside of the cultural institution. Might museums be (psuedo) civic spaces to experiment within? I now wonder how our discussions about dance in the museum might move towards how dance and the museum reflect on the roles they play in society at this time in our political history and, in particular, to human rights and – in the words of Edward Soja – spatial justice. Catherine Wood suggested that we move beyond thinking of dance as a ring-fenced activity in the museum and part of a larger framework of performance that includes considerations of gesture and choreography. In doing so we might also move towards a discussion of the effect of gesture, human movement, inter-subjectivity and access within the innate performance-like activities of the museum. Again, to include wider discussions as suggested above. There was a question from Hugo Worthy, Arts Curator at The Gallery, De Montfort University, who was attending as to how dance artists work differently in heritage versus contemporary museums. I responded that I am not interested in engaging the artwork. In fact, “it is none of my business”, I found myself saying, and I cannot claim to know how visual artist (dead or alive) would think about my dancing projects in front of it. 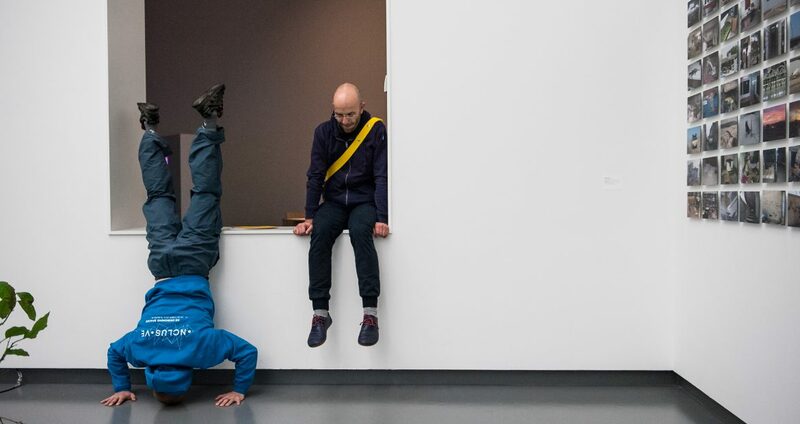 If someone in the Punt.Point project discovers a new way to look at art while re-positioning their body in the space, then that is their experience but not one that I necessarily am driven by nor want to engage in when creating my work. My work responds to the socio-spatial conditions and human infrastructure of the museum, which includes museum staff. It was of interest to note that, for Lucy, it was about engaging with the artworks and modes of spectatorship. In the second half of the day, Martin Hargreaves, lecturer and dramaturg moderated a panel that included Sarah Louise Spies, choreographer, curator and lecturer; Jamila Johnson-Small, dance artist; Tamara Tomic-Vajagic, Senior Lecturer in Dance, University of Roehampton and Leila Hasham, Associate Curator, Barbican Centre. Without having the space and time here to cover what were a very diverse set of thoughts I will touch on a few that still resonate with me. One was the prompt by Tamara to consider the agency of the dance artist in the museum and a following conversation regarding certain agencies. I was reminded of my Open Letter to Artists written in 2011 to dance artists, calling on a collective consciousness when accepting or rejecting work. I also mentioned that Equity’s Independent Dance Committee that is negotiating standards for dance artists working in museums, including Barbican, who sign up to agree to certain standards and pay. Jamila called our attention to the issue of access and identity of dance artists in the museum and the, primarily, white conceptual artists being shown. She asked Leila what her criteria was for curating and Leila replied that it is subjective and she is moved by what excites her and she is also interested in taking risks. She spoke of the show by Trajal Harrell’s Hoochie Koochie that she recently presented at Barbican as also an opportunity to make visible the work of an international artist here in the UK and to also push forward a catalogue of his work as part of the performance in the museum. Some concluding prompts were to continue to develop languages to talk about what we do and why we do it. There were calls throughout the event asking dance artists to articulate their reasons for being in the museum, which I feel is still an area less vocalised than from the curatorial directives. I made a call for dance to investigate its current practices. What do we mean when we say “dance”? Are we comfortable with the fact that dance is often part of and or folded into what is being called performance in the museum? What canon of dance do we want to be left behind in the museum when someone looks back at it 50 years from now? As a side note, and since attending the event, I have been reading Unworking Choreography by Frederic Pouillaude (2017). In it he presents various philosophical inquiries into dance and many of which sound refreshing, if not productively provoking for some of the thoughts touched on above. In it he says, “[…] dance is not an art in itself but rather the anthropological site where each art becomes possible” (p. 5) He goes on to quote Badiou’s formula in that, “[…] dance is precisely what shows us that the body is capable of art.” (2005, 69-70) (p. 9). I am not sure I agree with either of these statements but I like the grappling that is taking place within them. I might then suggest a revision of the title for the event on November, 9th. As many of the participants aim to continue to make a case for dance as art in the museum (and not simply a tool of engaging audiences) and as proposed above, then we must not separate the two words “dance” and “art”. But perhaps claim, “dance as art”. And, lastly, as dance has historically been in the museum since the mid 1940s or earlier we might embrace that we are there and then more easily move past the question of “why” dance in the museum to “how” dance in the museum. I look forward to those future discussions…. A big thanks to SDD for hosting this event and all the contributing people who attended. May this serve to share a bit of that day to those not present and promote further dialoguing.